Surface of Application For Leather. We are a highly acknowledged organization engaged in presenting the best quality range of Soft Acrylic Binder. 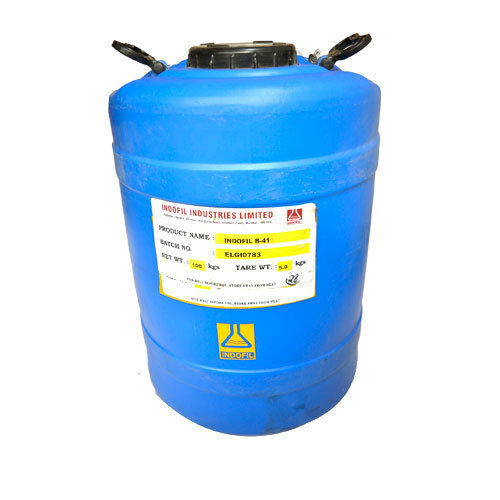 Soft Acrylic Binder is a general purpose aqueous dispersion of acrylic resin. The excellent mechanical stability of Soft Acrylic Binder makes it eminently suite able as a binder wherever modern finishing techniques are employed. Soft Acrylic Binder in common with most of the other members of the Indofil range of binders is freely miscible with all the materials generally used in the finishing of leather. For intermediate and final pigment coats Soft Acrylic Binder can be used with of harder materials. These modify the film properties of Indofil B-41 in various ways. Improved resistances to wet and dry rub testing can be achieved by incorporating Soft Acrylic Binder. Protein type materials and most wax emulsions can also be incorporated in finishes with Soft Acrylic Binder. These latter products are of course to produce a natural handle and increase the resistance of the finish to certain of the manufacturing processes to which the leather is afterward subjected. Commenced in the year 1999, MAJ Enterprises has become the highly acknowledged firm of the industry. We came into being with a view to be the customer’s most preferred choice and provide them only the best quality assortment. The ownership type of our company is a sole proprietorship. The head office of our firm is located in Mumbai, Maharashtra. To meet the various requirements of the customers, we are involved in trading a wide assortment of Water Based Paint Emulsion, Styrene Acrylic Emulsion, Soft Acrylic Binder, Pura Acrylic Binder and many more These products are precisely formulated and are assured to be best in terms of reliability and quality. In addition to this, we have adopted several stringent quality checking measures recommended by the industry to ensure quality approved range in the market. Besides, by making reliable business dealings with clients, we have earned the huge support and trust of large customers.